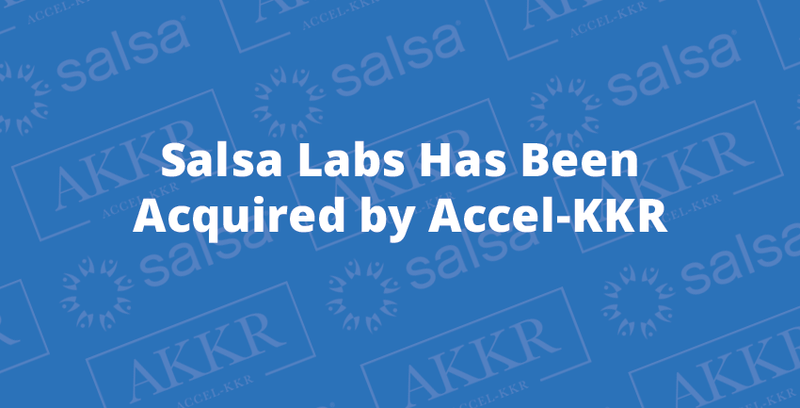 I’m writing to let you know that Accel-KKR, a technology-focused private equity firm, has acquired Salsa Labs. For some time, Salsa Labs has been actively pursuing a new strategic financing partner that shares our vision for building the best supporter engagement platform in the nonprofit world. I’m 100% confident we found that partner in Accel-KKR. With Accel-KKR backing Salsa Labs, we will have the necessary capital, resources, and expertise to make our software more powerful and easier to use, and to make our support and services more proactive and responsive to our nonprofit customers’ needs. Nothing about this acquisition will adversely affect our users (you) or our employees (the people that serve you). It’s business as usual. You’ll still have the same team that you’ve had in the past, but now we’ll have access to more resources to serve you even better. Going forward, we plan to continue to build upon our leading edge supporter engagement platform and empower nonprofits to more successfully fundraise, advocate, communicate, and manage supporter relationships. As part of this acquisition, I’ll be transitioning into the role of Chief Executive Officer. Prior to the 2015 merger of Salsa Labs and DonorPro, I served as Chief Executive Officer of DonorPro for eight years and I’m excited for the opportunity to build on the great progress that Scott Stouffer made during his tenure as CEO of Salsa Labs. I look forward to working with you to Engage and Change the World.